We need your help! We need medical and non-medical volunteers including veterinarians to perform surgeries, and vet hospitals that are interested in hosting the clinics. Fill out our interest form and we will keep you posted! 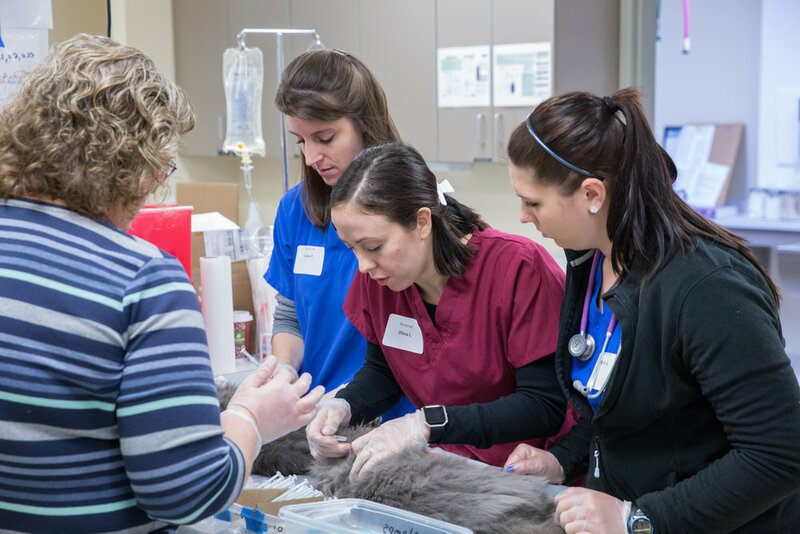 The Coalition provides regularly scheduled Fix Me mass spay neuter clinics through the generous support of donors, volunteers, and partner veterinarians. The program is designed to introduce and familiarize caretakers, trappers, and veterinary hospital staff on trapping, handling and caring for community cats. The large clinics take care of an average 50-100 cats in one day. All clinics are staffed solely by medical and non-medical volunteers in our community. Check out our volunteer opportunities to sign up to help. Our mission is to serve outdoor, free-roaming, (feral) community cats, therefore pet cats cannot be accepted in the clinics. Caretakers must fill out a TNR Request via the web form to register their cats for the clinic. If you cannot fill out the form online, please contact us to make arrangements. Check the calendar for upcoming clinics. All cats must be delivered in fully covered (with a large towel or sheet) individual humane traps (one cat per trap) with newspaper lining the bottom of the trap. No cats in carriers, airline-type plastic pet carriers, dog crates, cardboard carriers, boxes, or makeshift carriers will be accepted. For their safety and to minimize fear, transport cats in a covered vehicle. It is suggested that you do not stack cats as they might urinate through the traps onto each other. Please fill out the TNR Assistance Request form for help with traps or trapping. We also provide free trapping workshops and training for caretakers. Cats should not be fed after midnight the day before the clinic. Caretakers are responsible for dropping off and picking up the cats from the clinic. After surgery, cats should be kept in a climate controlled safe area to recover. They will have trouble regulating their body temperatures so room should be comfortable and not cold, or to hot. They can be released back to their outdoor homes the following day if there are no complications such as swelling, bleeding, nausea, or lethargy. Nursing cats will be moved to the front of the line for surgery in order to be picked up and released as soon as possible. Caretakers are responsible for picking up nursing cats as soon as the clinic notifies them that they are ready. Although every attempt is made to have groups of cats ready at the same time as a nursing cat, sometimes this is not possible and the caretaker may have to make several pickups. Generally kittens must weigh at least two and half pounds in order to be spayed/neutered. We will place kittens 8 weeks and under into our Kitten Rescue Team adoption program. Cats will be anesthetized and surgically sterilized. After surgery, the cats will be returned to their caretaker the same day for release the following day or as indicated on the discharge sheet. The tip of the left ear will be clipped on all cats to identify it as a sterile community cat. No exceptions. All cats will be microchipped. We cannot provide vaccine-only services at the clinics. Cats will NOT be tested for Feline leukemia virus (FeLV) and Feline immunodeficiency virus (FIV). Cats will receive flea, tick, and parasite treatment. Minor medical issues will be assessed and if possible treated. The caretaker will be informed if there is a medical issue that needs to be addressed by them outside of the clinic.